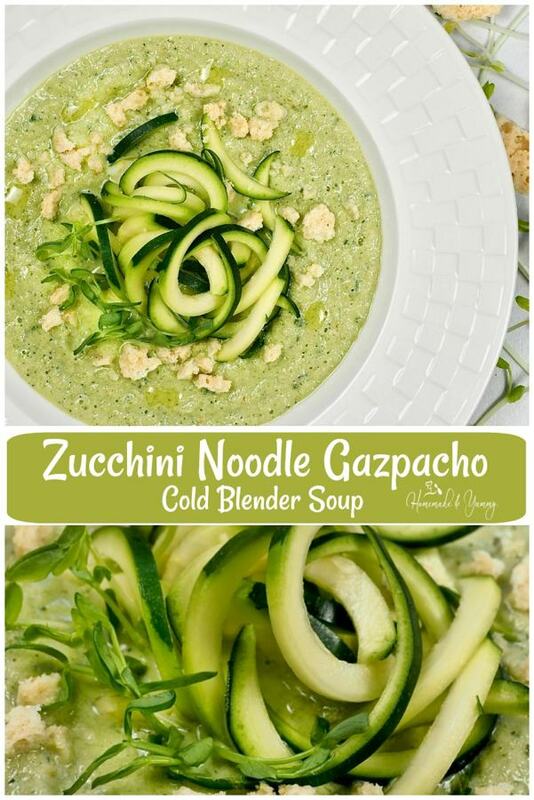 Zucchini Noodle Gazpacho Cold Blender Soup | Homemade & Yummy Homemade & Yummy | Fun delicious recipes and more. Nothing beats cold soup on a hot day. Zucchini Noodle Gazpacho Cold Blender Soup is perfect for lunch, or a stress-free soup and salad dinner option. The best part is, this easy gazpacho recipe is made in just a few short minutes. After all, I would rather be enjoying that sunny weather than spending time in the kitchen. Wouldn’t you? Fresh zucchini, cucumber, and a few simple ingredients, along with the help of a blender, create a thick, creamy gazpacho soup. Top it off with some fun zucchini noodles and parmesan crisps. 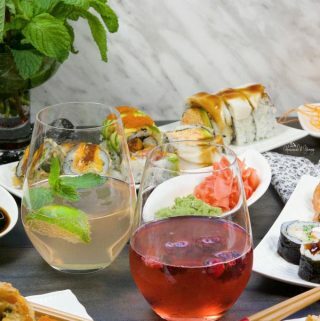 Summer eating is easy and fun. 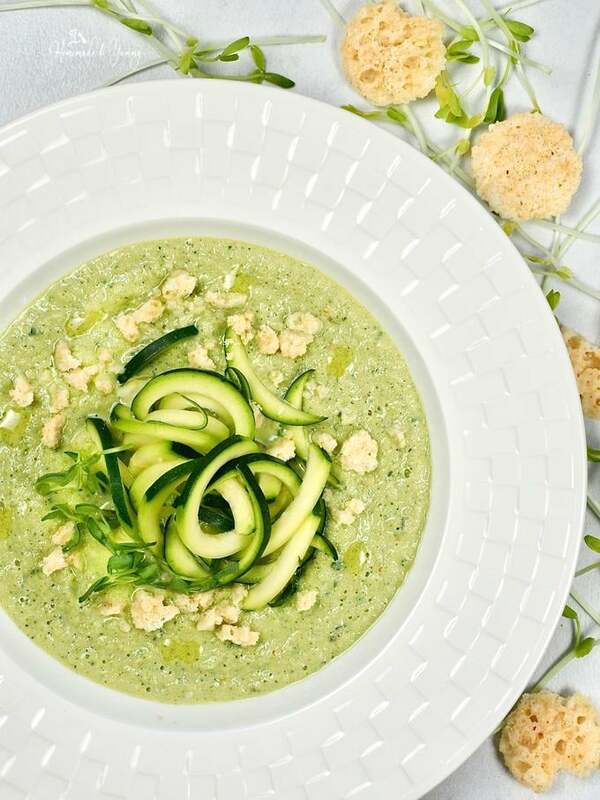 This zucchini noodle gazpacho recipe will certainly be a welcome rotation during the summer months. You can never have too many zucchini recipes, and I LOVE making zucchini noodles too. 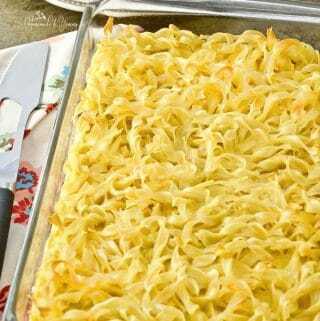 Do you call them noodles or zoodles? I refer to them both ways. Check out my Greek Zoodle Salad, or Zucchini Noodles with Shrimp. Ok, I will straight up you tell you this is my first time making and eating gazpacho. Can you believe it? I guess I was still in the mindset that soup has to be HOT not cold. Even when I told my husband that I was going to give this gazpacho soup recipe a try, he gave me that “deer in the headlights look”. See he is in that mindset too. Gazpacho is a cold soup that originated in Spain. For some strange reason, I thought it came from Italy. You can learn something new in the food world every day. 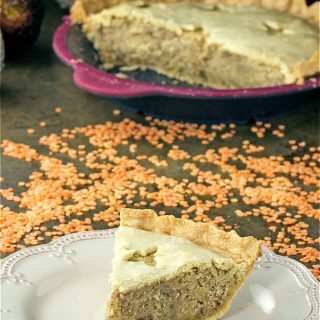 It contains a mixture of uncooked veggies, seasonings, and spices. 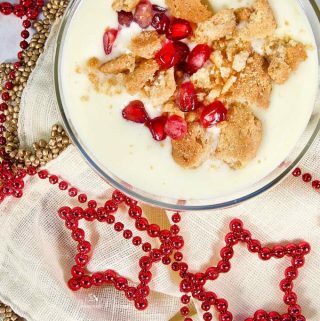 You can also add nuts, breadcrumbs, yogurt or sour cream to make it creamy. Some cookbooks classify gazpacho as a salad. That might take a bit more convincing for me. I would classify it as a want-to-be smoothie, LOL. In fact, that is how I explained it to my daughter (who thinks soup should be hot). I said it was like eating a chunky smoothie. Whatever class you want to put gazpacho in, I have finally found out it tastes DELICIOUS! I mean how can you not love it, especially this easy gazpacho recipe? Throw everything in a blender and call it dinner. I have even convinced my husband that in fact soup can be eaten cold, he LOVED it! Now I have to work on my daughter. A few simple ingredients are all that is needed to make this simple gazpacho soup recipe. This has got to be the easiest soup ever. Have you ever made blender soup? So good. In fact, when I make Cauliflower Blender Soup, or Pumpkin Soup in the blender, they taste like I have been simmering them all day long. I will say, you need a REALLY good blender for the best results. An immersion blender works well too. 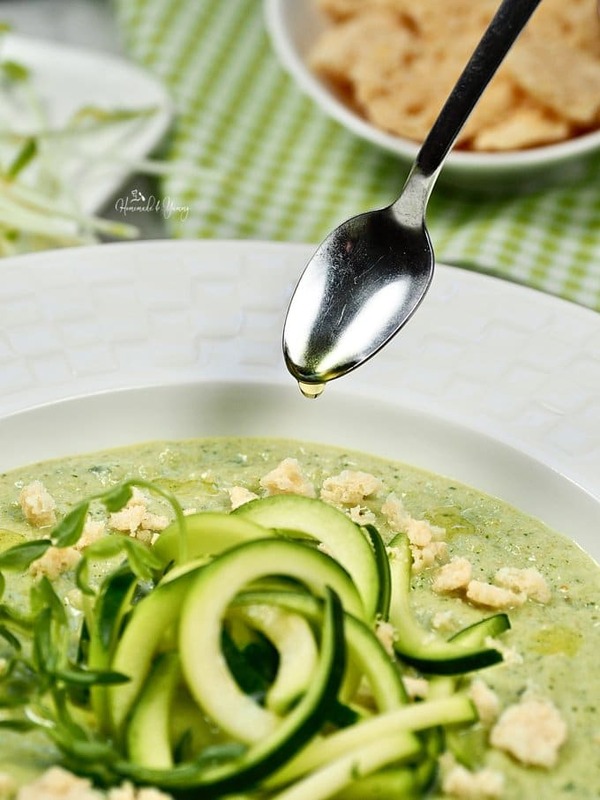 For this zucchini gazpacho soup, place all the ingredients in the blender and pulse until you reach your desired consistency. That’s it. In a few short minutes, your soup is ready. You can eat it right away if you like. 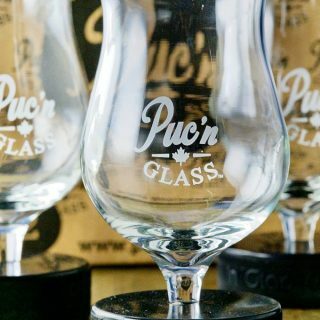 but I prefer to get it nice and chilled. 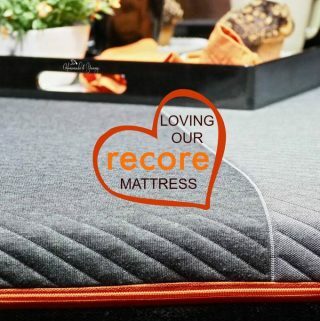 Perfect for making the day before. 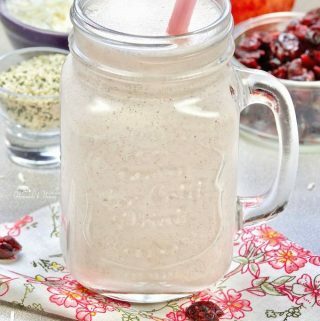 If you want to eat it right away, you can add some ice in the blender along with the other ingredients. 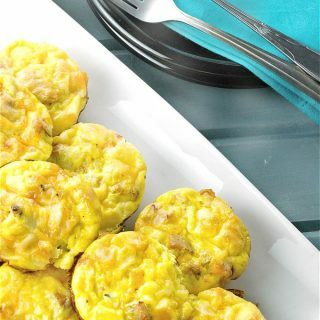 Summer meals should be easy and delicious. 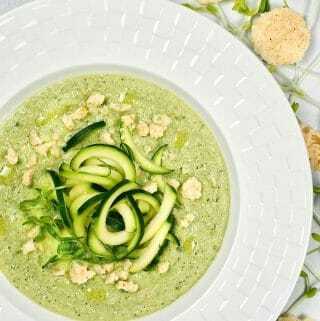 This Zucchini Noodle Gazpacho Cold Blender Soup is quick and perfect for hot weather eating. Give it a try and see. You just might convert a HOT soup lover into a COLD soup lover too. Don’t forget to sign up for my WEEKLY NEWSLETTER and grab your FREE printable. If you would prefer to get PUSH NOTIFICATIONS instead, CLICK the PURPLE BELL on the bottom right of this page. 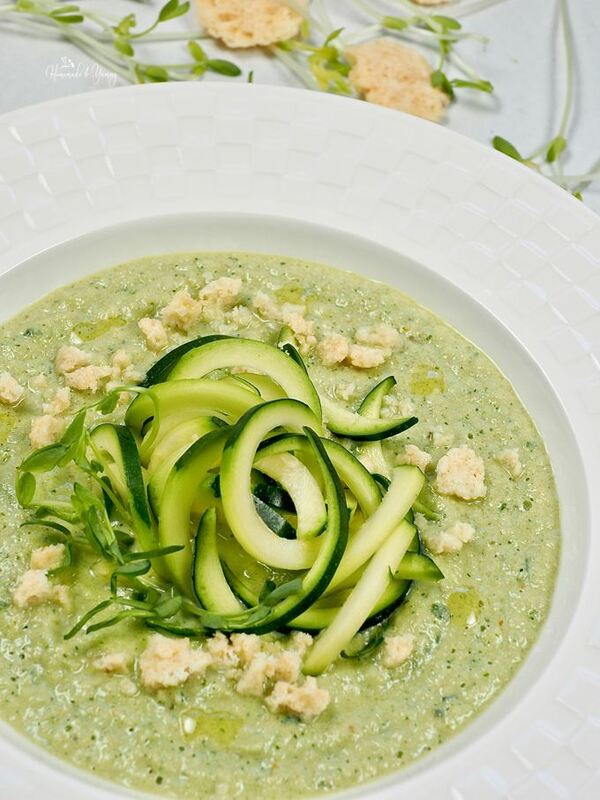 This Zucchini Noodle Gazpacho Cold Blender Soup is the perfect COLD meal on a HOT summer day. Easily made in minutes with the help of a blender. Garnished with zucchini noodles or call them zoodles if you wish. Delicious patio eating. 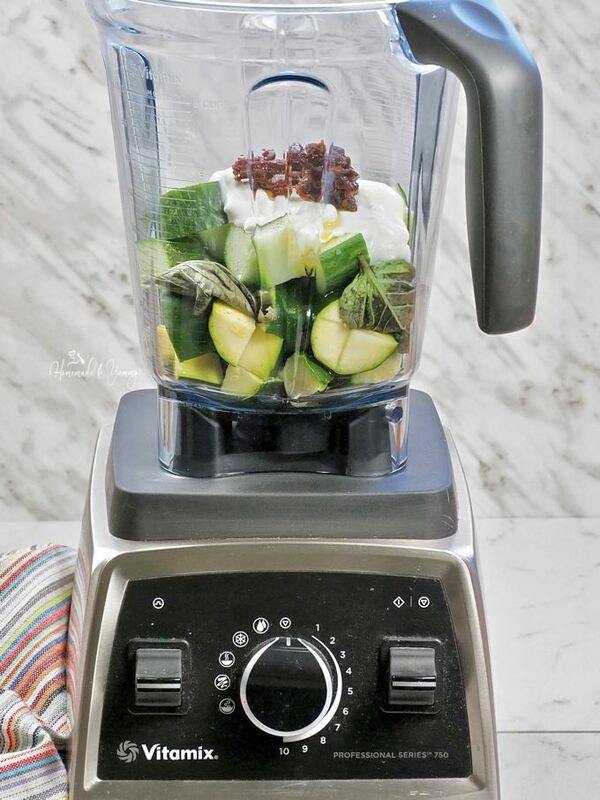 Wash and slice the zucchini and cucumber and place into a blender. Add the rest of the soup ingredients into the blender. 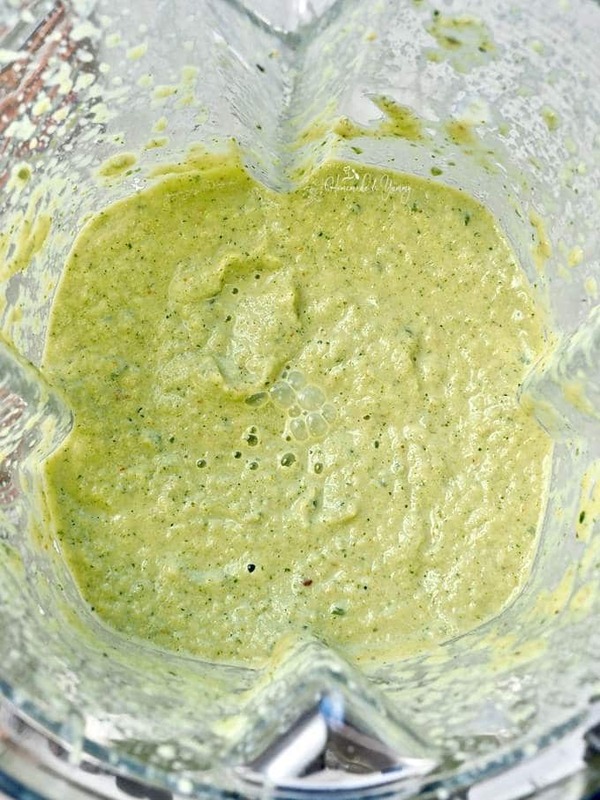 If you are going to eat the soup right away, you may want to add a handful or two of ice to the blender as well. This will chill the soup as you blitz it. Put the lid on and pulse until you reach your desired consistency. 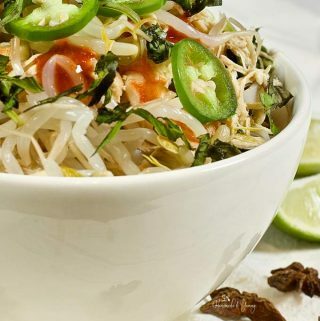 If you like you can pour the soup into bowls, garnish with desired items and eat. I placed the soup in the fridge for an hour or so to chill. You can leave it in the blender or put it into a sealed container. 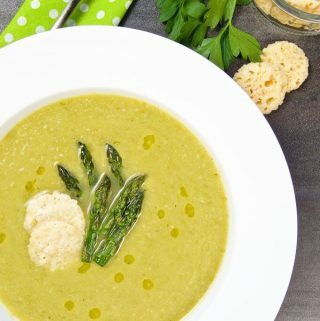 When ready to eat, pour the soup into serving bowls, add some zucchini noodles, pea shoots, crushed parmesan crisps and a few drops of Italian flavoured olive oil. 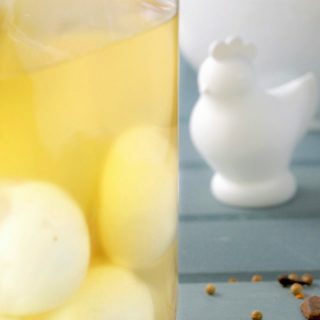 This soup can be made the day before and kept in the fridge till ready to use. If you want a thinner soup, you can add a bit of water. I am so doggone tired of winter! Here it is St. Patrick’s day and it’s snowing outside. ARGH!! 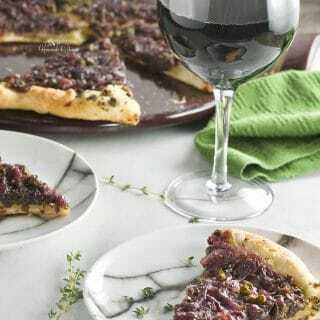 So I started looking for spring and summer recipes. 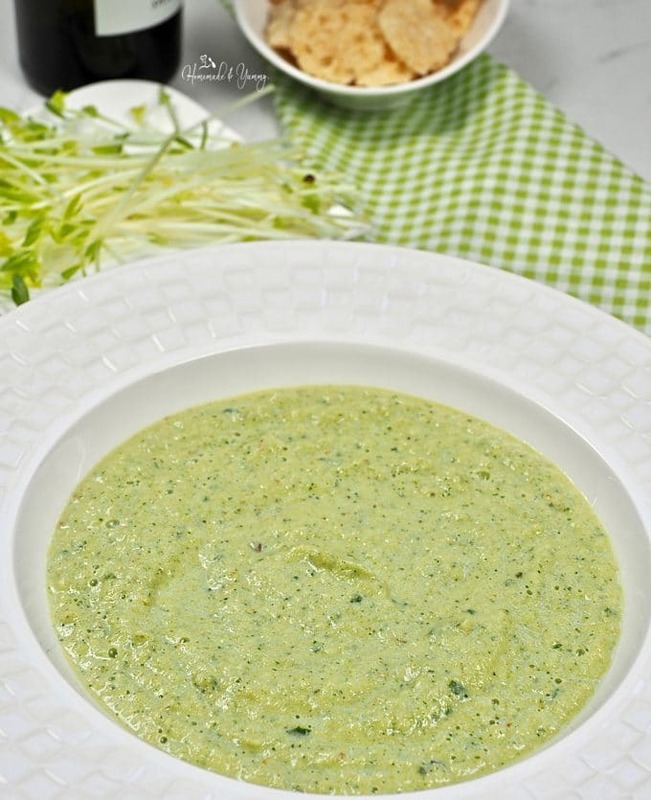 This zuccini noodle gazpacho is a soup that I know that we’ll all enjoy. Yum, then have something that was made on the grill. And of course dining outside. Well, I’m pinning the recipe – I made it last year and I didn’t pin. Now, I’ll have it. Thank you. I have been done with winter for MONTHS!! At least the sun is shining!! I am in GRILLING mode…and once that stupid snow goes away…the BBQ will be cooking!! What a great take on regular gazpacho! I love the idea and I bet it tastes so refreshing. Nutritious and refreshing I am so looking forward to warm weather and going to a cold soup versus a hot one will be a nice change. I’m pinning!! Thanks…and I am SO ready for this winter to go away. Craving the SUN!! This gazpacho soup is both delicious and so flavorful. I love the flavors you have combined to make this gazpacho and topping with zoodles is fantastic! They add a perfect amount of crunch! Yes this really is a fun and quick soup to make….and delicious too. 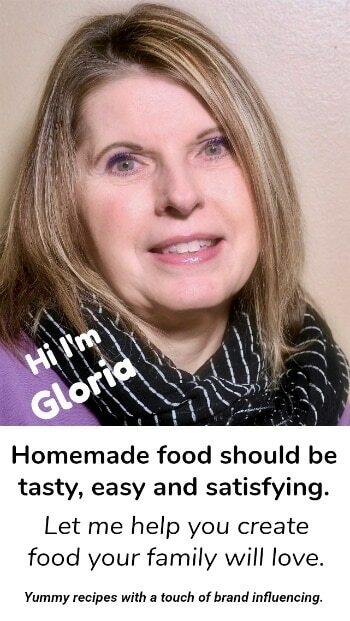 HAHAH….well I hope you give this recipe a try soon. Thanks so much for stopping by. What perfect timing! We have lots of 90 degree weather in our forecast and my husband and I have been struggling to think of oven-free meals. We’ll definitely have to give this a try this week! No oven, stress-free is all about summer eating for sure.